Bitcoin’s limited supply is about to get a bit more limited. Barring an unforeseen event, the 17 millionth bitcoin is likely to be mined in the coming day, data from Blockchain.info shows, a development that would mark yet another milestone for the world’s first cryptocurrency. That’s because as per bitcoin’s current rules, only 21 million bitcoin can ever be created. Stepping back, the milestone, the first million-bitcoin marker to be crossed since mid-2016, is perhaps noteworthy as yet another reminder of the technology’s core computer science achievement – digital scarcity created and enabled by shared software. In short, bitcoin’s code, since cloned and adapted by scores of other upstart cryptocurrencies, ensures that only a set number of new bitcoins are introduced to its economy at intervals. Miners, or those who operate the hardware necessary to track bitcoin’s transaction set, are rewarded with this scarce data every time they add new entries to the official record. Still, there’s a lot of variability in the process. Of note is that it can’t be precisely predicted when the 17 millionth bitcoin will be mined or who will mine it, due to the many minute variances that are created in keeping a common software in sync. That said, there’s a relative predictability. Each bitcoin block produces 12.5 new bitcoin, and as bitcoin blocks occur roughly every 10 minutes, about 1,800 new bitcoin are created each day. As such, it’s perhaps best to view this event as a “psychological barrier,” Tetras Capital founding partner Alex Sunnarborg told CoinDesk, one that is interpreted differently by different communities. Others see the milestone as one that’s ripe for appreciation of the technology and its achievements. “I think it is awesome,” Tim Draper, the venture capitalist who bought millions of dollars worth of bitcoin seized by the U.S. government at auction in 2014, said of the coming milestone. Others sought to suggest the milestone is one that should be considered as an opportunity for education about both the features of bitcoin, and those of cryptocurrencies broadly. For example, unless all of the humans who operate the computers running the bitcoin software decide to make a change (a perhaps unlikely scenario today), there’s really no way to ever introduce more new bitcoin. This achievement, a technical reality, has played a key role in bitcoin’s association with money, economics and other scarce, naturally occurring assets. In this way, the goldbugs and readers of Austrian economics who piled into bitcoin early on were quick to realize the value of the feature, perhaps giving rise to the term “cryptocurrency” itself. Trace Mayer, one of this group’s most vocal members, summed up the philosophy in a recent tweet, in which he argued governments might seek to prevent users from holding bitcoin in the future. “Increasing money supply is a means to confiscate through inflation which is a form of taxation without representation or due process of law,” he wrote. Even the new way new bitcoins come into being, called “mining,” is a nod to the gold analogy. Rather than being issued by a central bank, bitcoin is created by a network through the work of maintaining the blockchain. When a miner finds a valid hash for recent transactions, solving the bitcoin protocol’s puzzle, he or she is rewarded with a “coinbase transaction,” bitcoin credited to her account. A little bit of cryptocurrency is created and deducted from the final supply. How participants have been rewarded has, of course, changed over time. When bitcoin’s founder Satoshi Nakamoto mined the first bitcoin block on Jan. 3, 2009, he created the first 50 bitcoins. This reward stayed the same for another 209,999 blocks, when the first “halvening,” or reduction in rewards, took place. It didn’t come as a surprise. Every 210,000 blocks, according to a hard-coded schedule, the network reduces the block reward by 50 percent. Following the most recent halvening, in July 2016, the reward is 12.5 bitcoin. That means that while there are only 4 million bitcoin left to mine, the network will not reach its final supply in anything like the nine years it’s taken to get this far. As the halvenings halven, the rate of monetary inflation – supply growth – slows. 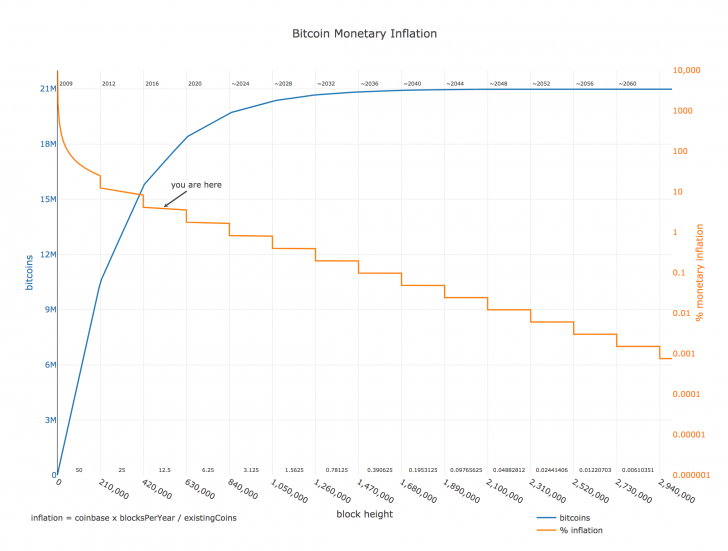 BashCo, a pseudonymous moderator on the r/bitcoin subreddit, has plotted the trajectory of bitcoin’s total supply (blue curve) against its rate of monetary inflation (orange line). Assuming the bitcoin protocol remains the same (a new block is mined every 10 minutes on average and the halving schedule and supply cap are unchanged), the last new bitcoin will not be mined until May 2140. With this in mind, the chart hints at another common talking point when acknowledging the milestone – that bitcoin is programmed to run for a very long time. Jameson Lopp, lead infrastructure engineer at wallet provider Casa, was quick to remind CoinDesk that bitcoins are divisible, and that as such, the smallest parts of each bitcoin can hold seemingly infinite value. But there are other quirks to the software as well. For one, bitcoin will never actually reach 21 million units, partly for mathematical reasons, partly because miners have not always claimed the full reward. On May 17, 2011, for example “midnightmagic” claimed a 49.99999999 block reward, rather than an even 50. Further, to be clear, bitcoin does not stop running when 21 million bitcoin are produced. At that point, the idea is that miners would be compensated purely through the fees, which they already collect. (Though some scientists have sought to project whether such a market would work in practice). 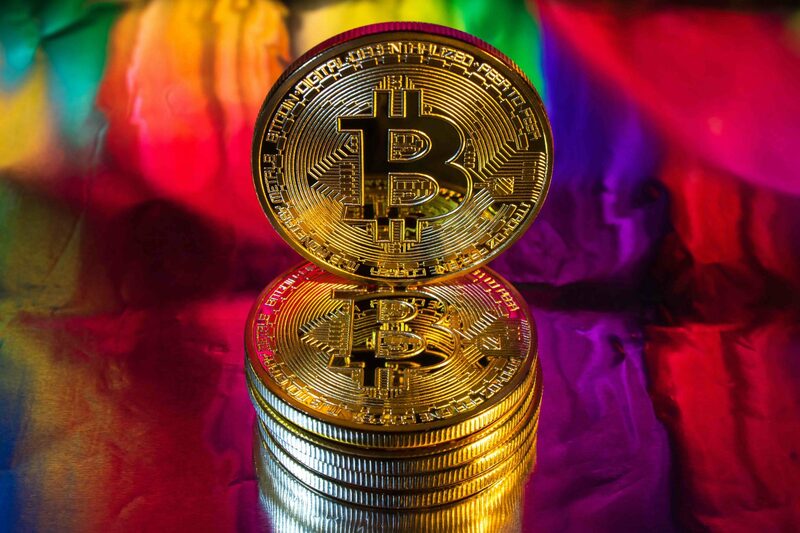 With so many questions left unanswered, if anything, the event serves as yet another reminder of how far bitcoin has come, and just how far it has to go. A more detailed explanation of the bitcoin’s supply and digital scarcity can be found here.